I started this blog on Earth Day 2012 – my small contribution to countering these trends. It’s high time to see how I’m doing. I will dedicate the two next blogs to such assessments, given the momentous and alarming trends that we have all experienced in 2016. My hope is that by doing so, I will help myself (and you!) be able to start 2017 with an optimistic smiling face and some helpful resolutions in mind. I am an academic and teacher. Any school assessment necessarily involves questions such as “how well is the institution satisfying its goals?” and “how are the students benefiting from the training that the institution provides?” My quarterly assessment blogs, which I started in July of 2014, have all focused on self-evaluations – mainly in terms of exposure and feedback. This time I want to turn my attention to you, the readers. The end of the year also coincides with the end of the semester in most schools. One of the most important measures of students’ learning is their performance on their final exams. I teach a General Education course on “Energy Use and Climate Change.” The only prerequisite (November 29th blog) for this course is Junior Standing; as far as I am concerned, even that condition is superfluous. As I tried to explain here in a series of blogs starting May 24, 2016 (“Educating for the Anthropocene”), my wish is for all 7.3 billion citizens on Earth (babies get an exemption) to have access to similar material. With that in mind, I am attaching the final exam that I gave my students at the end of the course. That way you can all try your hands at finding out how you (and I) are doing. The three sections of the exam A, B and C were designed to cover three categories – A: thinking, B: skills to calculate quantitative implications, and C: following current events. Students got two hours to complete the exam. In addition to the exam my students got an additional page that includes all necessary unit conversions and the chemical reactions that are involved in using the three main fossil fuels: coal, petroleum, and natural gas. In attempting to solve the exam, you can take as much time as you need and freely use the information available on the internet. Please don’t put the questions to Google or Wikipedia and type the answers verbatim; this would be too transparent and embarrassing. Here is the exam: Good luck! Answer all three parts of the exam (A, B and C): Section A is worth 60 points, section B is worth 40 points, and section C is extra credits worth 10 points. A. Answer one question from section a and one question from section b. Select one of the two indicators and try to justify its inclusion in the climate change category. i. Energy and water: one doesn’t flow without the other with an emphasis that managing energy-water linkages is pivotal to the prospects for successful realization of a range of development and climate goals. Select one of these two trends and explain the reason why the IEA selected to focus on this trend to achieve the objectives of the Paris meeting. B. Answer one question from section a and one question from section b: Unit conversion page is included on the bottom of the test. 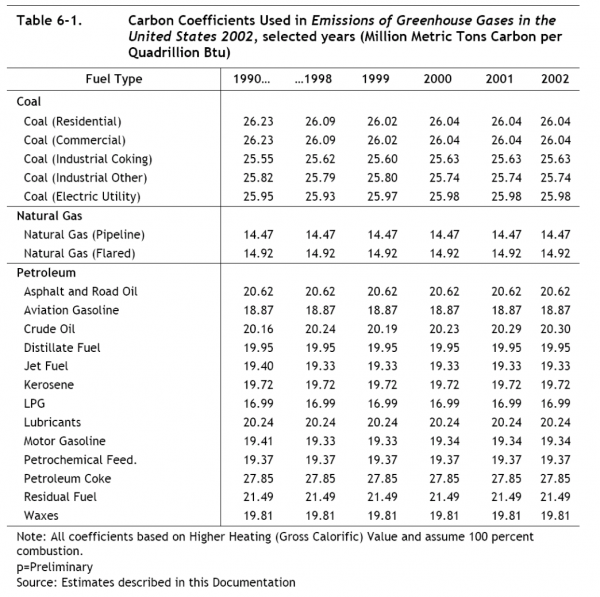 The table below shows the carbon coefficients of various fuels as calculated by the Energy Information Administration (EIA). Select one of the two Natural Gas entries and compare these values with first principle calculations. One value as an example will do. In class you have estimated that if present growth patterns will continue China’s GDP/Capita will approximately equal US GDP/Capita in about 50 years. Assuming again that present growth patterns will continue – what will be the approximate World population at that time? b. Answer one of the two questions below. An electric power generator of 1.5kW can supply electricity to an average American home. A modern wind turbine can generate up to 4 MW power. How many homes can it serve? (chapter 11). How much coal will have the same heating value as 10 gallons of gasoline? (chapter 10)? C. President elect Donald Trump declared over his recent presidential campaign that climate change is a Chinese hoax designed to slow the American economy. He promised to take the US out of the recent Paris global agreement that was discussed in section A. What are his options once he takes office and what are the expected consequences from his actions? This entry was posted in assessment, Climate Change and tagged Anthropocene, assessment, audience, Brooklyn College, Carbon, China, Clean Energy, Climate Change, Climate Change Denial, Climate Change Deniers, Climate Skeptics, CO2, CO2 emissions, Coal, CUNY, Donald Trump, Earth, Earth Day, EIA, Election, elections, Electricity, Emissions, Energy, Environment, exam, fake news, Fossil Fuels, Gas, Gasoline, GDP, Global Warming, globalization, goal, greenhouse gas, IEA, India, institution, nationalism, Natural Gas, News, Paris Agreement, petroleum, Population, Power, Power Plants, reader, Science, student, Sustainability, teach, teacher, Technology, test, Trump, US, vote, voter, Water, World, World Bank, xenophobia. Bookmark the permalink.